There were eight percent fewer farmers in Oregon from 2007 to 2012, with six percent less males and 15% less female farmers. The age of farmers under 44 years old decreased 22% between 2012 and 2007. The number of operators who have been farming for nine years or less — how the USDA defines a “new farmer” — decreased by 25% from 2012 to 2007. 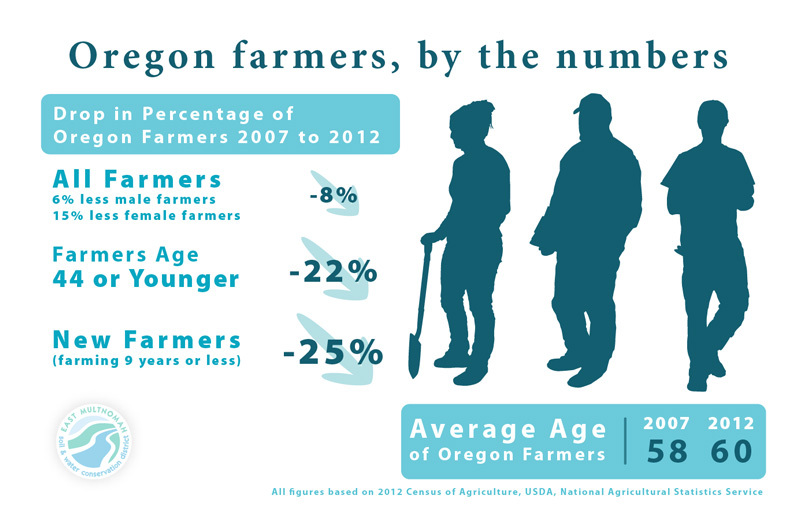 The average age of Oregon’s farmers is now just a hair under 60 — over two years older than it was in 2007 and exactly two years older than the national average. These data are alarming and tell a powerful story about future impacts to Oregonians and Oregon’s agricultural and natural resources. We are an organization with a vested interest in how farms utilize their natural resources and in keeping quality farmland in production. More specific census data for both Multnomah county and other counties across Oregon should become available in the next month or two, and we will continue to keep close tabs on these trends. These trends were the driving force behind EMSWCD’s Headwaters Farm Incubator Program, a mechanism for new farm development and promotion of conservation agriculture. This year there will be eight new farm businesses leasing land at Headwaters Farm, cultivating a wide range of vegetables, medicinal and culinary herbs, cut flowers, and honey. The goal is that by fostering these new farmers, EMSWCD is investing in the long term viability of local agriculture, farmland, and natural resources.